A solar flare occurs when magnetic energy that has built up in the solar atmosphere is suddenly released. Radiation is emitted across virtually the entire electromagnetic spectrum, from radio waves at the long wavelength end, through optical emission to x-rays and gamma rays at the short wavelength end. The pineal gland which regulates circadian rhythm and melatonin production is sensitive to magnetic fields. According to Russian scientist A.L. Tchijevsky, 80% of the most significant human events occured during a 5 year period surronding the peak of solar activity. A recent study in the New Scientist magazine indicates a direct connection between the Sun’s solar storms and the human biological system. 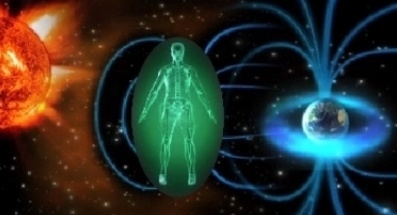 The conduit which steers Earth’s weather through the Magnetic Field on Earth is the same conduit that facilitates the influx of charged particles from the Sun through the magnetic (auric) field around the human body. The increase in the frequency and amplitude of geomagnetic sun storms is causing large-scale planetary changes which include earthquakes, volcanic eruptions, hurricanes, tornadoes, and windstorms. There is also indication of human disturbance as result of the solar activity. Solar activity is known to influence human consciousness. 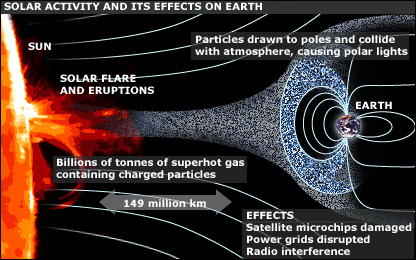 Solar flares affect the Central Nervous System, all brain activity (including equilibrium), human behavior patterns, and all of our psycho-physiological (mental/emotional/physical) responses. Symptomatically, solar flares can cause us to feel nervous, anxious, worried, jittery, dizzy, irritable, lethargic, exhausted, nauseous, and queasy. Some people may become unusually forgetful, and others may experience heart palpitations. People may also endure periods of prolonged head pressure and headaches. as they exert a powerful effect on our physical cellular level, causing our cellular memories to awaken and clear. Unprocessed emotions from past traumas and experiences are stored in the form of low frequency energy as cellular memories. Photonic waves from the sun consist of higher frequency energy that serves to elevate the lower emotional frequency of our cellular memories. As these cellular memories are re-calibrated to the higher frequency, we may find ourselves spontaneously releasing the lower emotions of sadness, anger, and grief, without knowing why. These sudden periods of ‘release’ may last up to twenty minutes, and may also include the sensation of the body heating up in the form of a “hot flash”. It may feel like a surge of unexpected feelings has surfaced from out of the blue, and have just as suddenly dissipated. The elements of our Divine Blueprint are interwoven within our cellular memory. 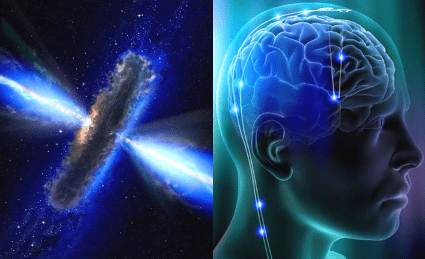 The recent infusion of photonic energies is amplifying our cellular memory, causing various elements of our Divine Blueprint to leak into our waking consciousness. As a result, many people are beginning to remember their Soul Purpose, and are suddenly driven to make changes in their lives to realign with a sense of higher purpose. Another ramification of the influx of photonic energy is that since it represents a higher frequency, it increases the power, speed, and manifestation capacity of our thoughts. We are quite literally able to exercise ‘instant manifestation’; whatever we think, we create instantly. We have never before experienced this heightened level of manifestation potential. Photonic energy blends with the vibratory frequency our thoughts, so it is vitally important that we place our attention on what we want to create, rather than what we do not want to manifest in our lives. We will manifest rapidly in the direction of our thoughts, and it is up to us to decide where to direct our attention. For those of us in the process of positive change and transformation, this energy is empowering and advantageous. On the other hand, those who are stuck in the past through victimization and anger will continue to manifest even more negativity, until they are ready to release the old way of ‘being’ and shift to a higher, more positive vibration. The good news is that we have free will to decide how we choose to use this rich and accessible resource of electromagnetic energy. The increased frequency and intensity of solar flares is helping to break apart old patterns that are no longer needed so that new patterns can emerge. This is a dynamic and inevitable process of change that has caused many people to feel agitated and uncertain in recent months. 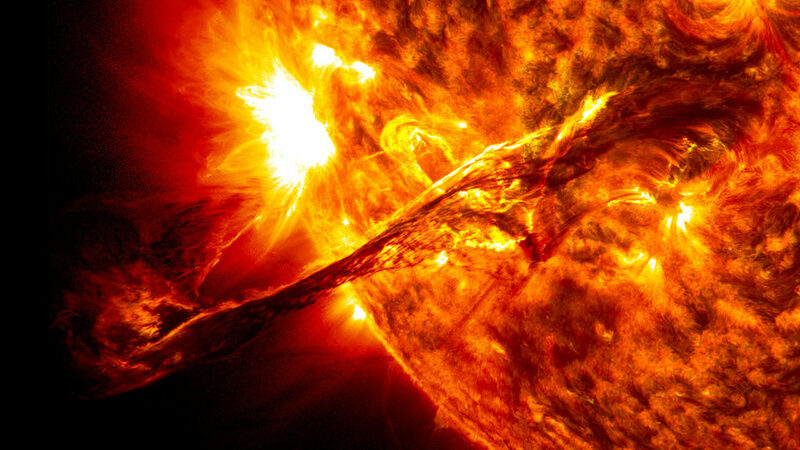 Solar flares have also wreaked havoc on technological instruments such as computers. As the increase in solar activity persists, new symptoms are emerging. Dimensions of time and space are beginning to ‘wobble’ erratically. Some people seem to be losing track of time, and/or they are losing words when speaking. For others, the day seems to simply disappear. A number of people are having difficulty sleeping, tossing & turning in the night and often experiencing unusual dreams. Others report that when they close their eyes at night, the world around them spins. Some of us are feeling huge power surges in our bodies; these surges are often followed by a drop in energy level. There are reports of nausea, body aches, pains, and dizziness. Some people are feeling a sense of overwhelming grief, while others are experiencing euphoria. There are reported cases of visual disturbances, inner ear issues, buzzing in ears, throat and thyroid issues, and cold feet. If you are experiencing any of the aforementioned effects, don’t worry– be happy! We are being offered a unique and powerful opportunity to consciously participate in the rapid advancement in our evolution as energetic beings. Our auric/energy systems are being re-calibrated to resonate at a much higher, finer frequency. The more informed and aware we are of the changes taking place, the more empowered we are to embrace this process as a necessary step towards the betterment of our lives. We are growing in the direction of mental, emotional, and spiritual awakening, with the extraordinary help of the Sun! On a practical, physical level, we can mitigate some of the more challenging effects of our energetic evolution by getting extra rest and drinking lots of water. For those who live near the ocean, a walk on the beach (or better yet, a swim!) will help to balance the incoming energies. In the meantime, we can all fasten our seat-belts, and enjoy the ride!